Raving about is for dishes that have halted conversations, inspired sighs of pleasure and on occasion, made me regret agreeing to share. This week’s rave: seared watermelon sashimi from Sunshine Co. in Brooklyn’s Prospect Heights neighborhood. I’d stopped into Sunshine Co. after a day of eating and drinking my way around town with a friend. We wanted something light and the concept of watermelon sashimi was unusual enough to still spark our curiosity. It did not fail. The dish was a surprise both visually and in taste. 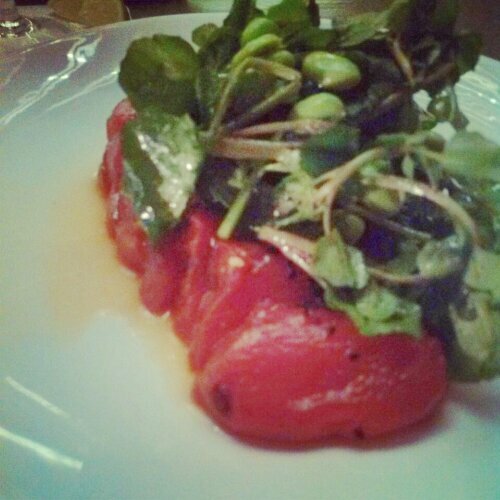 At a glance, the dish appeared as glistening barely seared tuna beneath a mound of greens. That was the first trick, as upon closer inspection the glistening deep red flesh was indeed watermelon. The fruit had been transformed: it’s color intensified and the flesh made denser, as if compacted, giving it the meaty appearance of raw tuna. With the first bite, there was no escaping the undeniable denser texture that came from the searing and marinating of the fruit and the flavors of watermelon were both concentrated and highlighted by ponzu along with a lingering note of nutty smoke from sesame oil. The second trick was getting my brain to remember I was eating watermelon. Finally, the lightly dressed greens, watercress and edamame, added a peppery crisp acidity to every bite which just kept me wanting more.